The beautiful Langtang Valley Trekking is one of the most naturally verdant and culturally bounteous treks in northern Nepal. Because Langtang has so much to offer, people of all preferences can enjoy a wide myriad of hallmarks based on their choices, needs and wants. The ivory peaks reveal the gorgeous Tamang culture and their tender hospitality to any individual longing to undertake the journey. Along with being a home to the majestic peaks, Langtang is also a haven for floral and faunal which thrive in the mystical region. The Langtang Valley Trekking starts with an informative sightseeing tour of the Kathmandu valley. From the city, trekkers then drive towards Sybrubensi and trek on the trail that coruscates on the peripheries of Nepal and Tibet. It is a wonderful journey where trekkers can experience the unique Tamang culture of the Langtang valley up close. 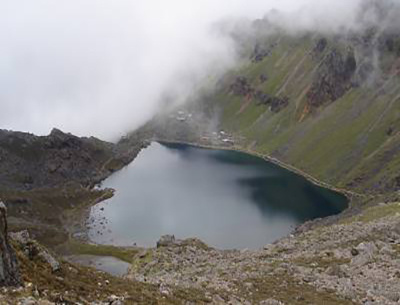 Moreover, the Langtang Valley Trek is also relatively an isolated trekking experience, with not many crowds. Because of this, it is quite suitable for trekkers who are looking for an off-the-beaten-path trek where the trekking trails are not thronged. Shadowed by the Langtang Lirung (7227), the Shringi Himal and the Ganesh Peak among others, the valley is a gorgeous hamlet of untouched natural terrains. Furthermore, the Langtang valley is also known as "the Valley of Glaciers" and its wonderful faunal and floral beauty presents trekkers with daring and paradise-like experiences. Due to the unadulterated Tamang culture, trekkers can also visit many Gumba and monasteries that are scattered throughout the valley. The rhododendron-laden path is also ornamented with many brooks, streams, and rivers that add more beauty to the already charming landscape. 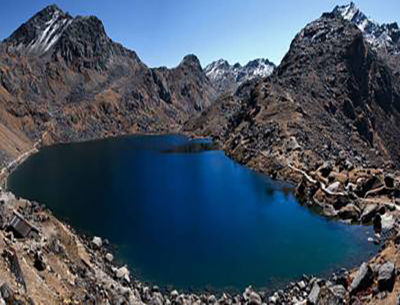 The Langtang Valley Trek is an easy trekking journey that can be done all the year round. However, the best months to do the trek are from March to May and September to December. The Langtang Valley Trek packages by Destination Unlimited Treks blends together all of the best features and aspects of the region to give our customers a trekking experience that is memorable. We provide the best services and our customer's safety, comfort and satisfaction are always our top priority at all time. You may arrive in Kathmandu at any time. When you arrive, you will be welcomed by one of our airport representatives. He will help you get transferred to your Hotel. Overnight stay at the Hotel. On this day, you will have a guided sightseeing tour of the Kathmandu city. The tour includes visiting four of the major UNESCO World Heritage Sites of the city- they are the Pashupatinath temple, the Kathmandu Durbar square, the Swayambhunath Temple and the Boudhanath Stupa. Each of the sites is considered to be of great historic and religious essence to the country and each present unique architectural styles. After the tour, you will be transferred back to the Hotel. Overnight stay at the Hotel. Driving through the countryside of Nepal, you will head from the city towards Sybrubensi towards the north of the capital. The drive is pleasant and filled with fleeting glimpses of the village life of the people. Along the way, you will reach Dhunche and driving alongside the Trishuli River, you will reach Sybrubensi. Overnight at guesthouse. Crossing the Bhote Koshi River, you will follow the Langtang Khola- until finally the path gradually climbs towards Bamboo. From here, the trek then ascends gently downwards to Ramche through Bamboo. The trail then levels out flat until the Lama Hotel. En route, you can also catch glimpses of the Red Panda in the woods as the forests of the Langtang valley are known for being a safe haven for these endangered animals. Overnight at guesthouse. Today is a relatively moderate trekking day. You will be walking on the route that follows settlements of the valley like Gumanechok and Ghoda Tabela. Further on out from the pastures lies the Langtang village- an old village from where the views of mountain peaks like the Langtang Himal (7227m), the Shingri Himal (7161m) and the Ganesh Peak (7422m) are quite beautiful. Overnight at guesthouse. Tracing your way back, you will be trekking on the familiar trail down towards the Lama Hotel. Along the way, you can enjoy fantastic views of towering mountains that look like giant walls of ice and ivory. 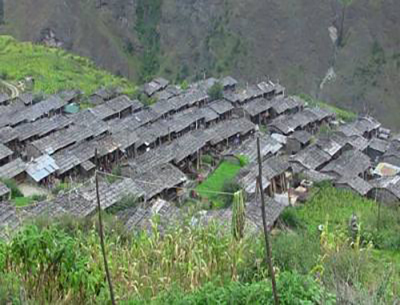 You trek through Tamang settlements and observe their lifestyle and Tibetan-influenced culture. You pass Thangshyap village and Gumanechok to finally reach Lama Hotel. Overnight at guesthouse. An easy trek downhill again, you will follow the river and pass through the Tamang settlements once more back to Sybrubensi today. You will lose a fair amount of altitude today as you trek to Sybrubensi. On your final day of the trek, you can reflect upon the feats you achieved during the length of the journey. Overnight at Guesthouse. From Sybrubensi, you will drive back to the city, bidding the Langtang Mountains goodbye. The drive back is as pleasant as it was driving forth, as you can see the peaks fading away in the distance and the skyline being replaced with giant green hills dug into agricultural farms and winding rivers that cut across the land like serpentine silver ribbons. Overnight stay at the Hotel. Approximately three hours before your flight, you will be dropped off at the airport by one of our company's airport representatives, from where you will depart.